The righthander’s initial spring training start has been delayed by lower back stiffness. 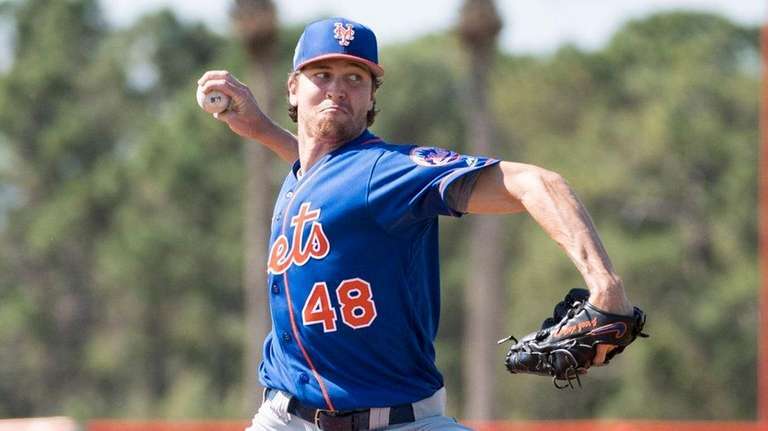 PORT ST. LUCIE, Fla. — The competitor in Jacob deGrom wants to be ready to pitch for the Mets on Opening Day. But the realist in deGrom admits that might not be possible. Still, the righthander isn’t giving up hope that he can be considered for the season-opening assignment on March 29 against the Cardinals at Citi Field. DeGrom took his first step on Wednesday when he threw what he called “a modified side” at First Data Field. DeGrom’s initial spring training start has been delayed by lower back stiffness. Manager Mickey Callaway said deGrom might not be ready for the first week of the season. But that doesn’t mean deGrom doesn’t want the Opening Day start. The important thing is deGrom said he felt “great” after throwing off a mound for the first time in spring training.